The grass is always greener on the other side. At least that’s what the Billy goat gruff told himself when he braved the transition over to the other side of the bridge, troll and all. Troll aside, relocating to a different town can be stressful and overwhelming in itself, but in the last decade there seems to have been an influx of itchy footed ex pat citizens making their way to over to the other side of the world, clutching their passports, eager and ready to begin a new life. Australia has experienced an incredible immigration boom in recent years with the biggest population expansion the country has seen in fifty years and reports show a 42% rise in population within the next 50 years to come. This has been due to a flood of propaganda in order to encourage workers around the world to enhance their career by taking up jobs within Australia – and it seems that the campaign has already been a resounding success. So what makes Australia the crème de la crème of career relocation countries? An assessment process which analyses a person’s skill set and language to decide whether they are eligible to transfer over to work and live. The Australian Immigrant facility has a lengthy occupation list, advertising their requirement everything from carpenters, accountants and baristas to nurses, doctors, social workers, locksmiths and electricians. On average, the pay is more too, and for some skilled jobs, such as ones related to management and consultancy, an ex-pat is looking at as much as a 7000 dollar pay rise a year for their job, a very attractive incentive to relocate. Oz seems to be one of the last remaining countries to actually like estate agents, offering them nearly triple what they would earn in a country like the UK. Because Oz has made it their mission to attract professional people who will benefit their country, their economy is a lot more stable than their western neighbours. They have the resources to secure long lasting jobs for immigrants and the financial ability to support buying power such as property purchasing. Australia has certainly had a bout of economy flu but it is weathering the storm a lot better, which has attracted people from the nations who seem to be suffering more from the frosty financial climate such as the UK and USA. When a person is slaving away five days a week at their job, they like to be able to enjoy the fruits of their labour and as reports show, in Australia your money seems to go further. In a recent survey, expensive staple items showed themselves to be cheaper in Australia compared to the UK. McDonalds compares their prices worldwide and in 2009, a Big Mac was shown as being cheaper to buy in Australia than in the UK. Milk and beef are the country’s cheap commodities and very easy to come by. But the differences don’t stop there. The Reserve Bank of Australia revealed interesting comparisons in house prices, showing that income from homes in Australia was higher than countries such as the UK, Ireland, Canada and the US. This information has compounded the belief for many that they could be living in Oz in a nicer home with more space and a more expendable cash flow. With a beautiful climate, ample array of stunning beaches and buzzing towns to enjoy, it is only fair workers get more annual holiday, right? 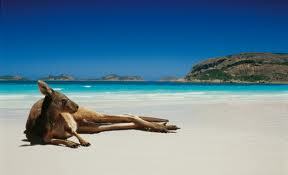 The Australian average annual public holiday is more than the UK by 11 days per year. This escalates considerably depending on what part of Oz you live in. If you live in Tasmania you will get 21 days off annually as well as your four weeks holiday entitlement. Flight to Tasmania anyone?